We was recently lucky enough to receive a copy of ‘Fuss Free Vegan’ by by Sam Turnbull (published by Random House). We came across Sam Turnball’s blog back before Christmas when we were looking for a good vegan recipe for sugar cookies, and oh-boy, we found one. Our entire office was fooled by the delicious light cookies and that is where the curiosity started. 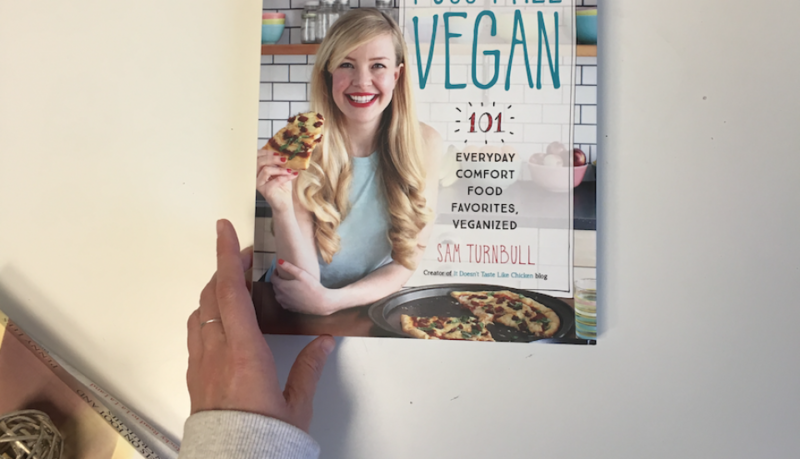 While Sam’s book is almost always healthier than the general cookbook, it offers up great recipes for comfort food vegans/ lactose intolerant folks miss so much. We loved the layout of the book, without sounding pretentious, it was very aesthetically pleasing, with gorgeous text types, pictures and we love a good organised layout! There’s tips and tricks, pantry must haves (most of these are also dried so you don’t have to worry about things going off). We also loved how most of the recipes could be changed as it mentions somewhere on the page to be more naughty or healthier. We already made some desserts so knew they would all be amazing, so we decided to go with a breakfast and lunch/dinner. We wanted to go outside our comfort zone and actually cook something we had either never done or would never think to do. First up, the tofu scramble. Something we had honestly never thought to try! On a personal note, we can’t have dairy and eggs are not really our cuppa-tea, so scrambled eggs is something we haven’t had in a long time. It was incredibly simple to make, took around 5-10 minutes and was genuinely delicious. Tofu is also a great source of calcium so we are always looking to add it to our diet whenever we can since we no longer consume dairy. We added in a few cherry tomatoes we had to use up and it really added a lovely finishing touch, Sam does recommend sundried tomatoes, so next time we make it we’re definitely going to try that! Next up, Cheesy Broccoli soup. Now, we have a confession to make. We’ve never made home-made soup… so as a challenge and also a change, we thought we’d tackle this one! Just like the scrambled Tofu, it was so much easier than we thought. You quite literally cook the ingredients and then blend. Much like the cookies, we shared this around, my parents didn’t realise no cheese was added firstly (thank you Nutritional Yeast!) and my mother said it was the best broccoli soup she had ever had. We made enough for about 10 servings, and I only had one… the rest was all eaten by family members. I actually ended up making another batch the next week and then freezing some for emergency ill-days. 100% would make again and recommend! Overall, if you’re vegan, meat eater, fussy eater… human? This is the cook book for you. Everything tastes better vegan in our opinion, we genuinely believe just cutting out certain things when you can is better than nothing and no book is better than this one. Vegan food doesn’t have to be what Pier’s Morgan makes it out to be, it’s not just raw veg thrown into a bowl, it can be better than the average comfort food and when its healthier it tastes even better. So impressed, so excited. It’s honestly very refreshing to find a cookbook we can have fun with, trust to be tasty and eat guilt free. Hurrah! Thank you to Penguin Random House for so kindly sending a review copy in exchange for a honest review.